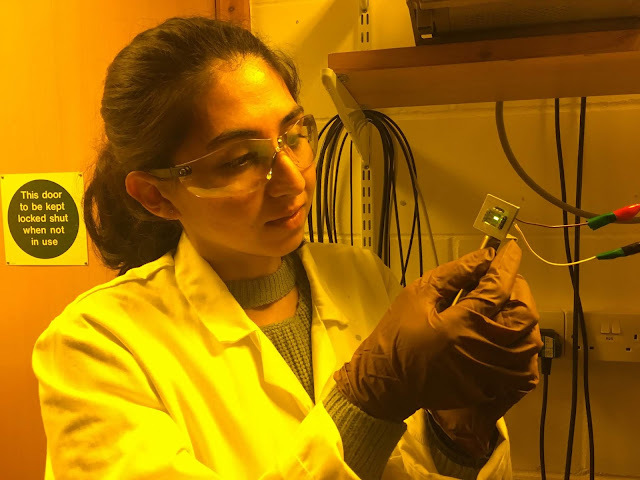 (SOLAR) POWER UP: Arfa holds an organic LED with a small, yellow, brightly it pixel. Part of her work involves understanding the reverse mechanism of converting electricity to light. I know it’s a bit cliché , but I was amazed by how one could create a beautiful rainbow with a prism. That understanding of how white light is made of photons traveling at different speeds was incredibly mind-blowing. When that idea was demonstrated to me for the first time in school, it blew my mind! 2. Describe a memorable moment from an SPIE event or conference. 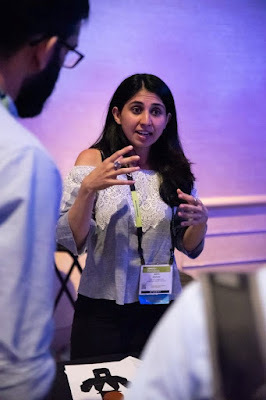 In August 2018, I attended the SPIE Optics + Photonics Conference in San Diego to represent my student chapter as President, and to present my research for the first time to such a diverse and expert audience. It was also my first time traveling to the West coast. As this is the final year of my PhD and I'm working to find my path ahead, it was incredibly helpful to meet students in the same boat. We were from various parts of the world, and I heard their opinions on where the field is going and what the future holds for us all. All the activities, especially the Student Chapter Leadership Workshop, allowed me to meet more people than I would have otherwise. It was a truly rewarding experience, both professionally and personally. 3. Share the story of your favorite outreach or volunteer experience. When we talk outreach, the first thought is always of a non-scientific audience. But at the SPIE Optics + Photonics conference, for the first time, I experienced sharing applications of light with an scientifically expert audience. I was talking about 'the color and sound of cancer.' Although my PhD is focused on making solar cells more efficient and working with light emitting diodes (LEDs), I was trying to explain to others how important light technology is for detecting cancer in its earliest stages. It was exciting to share my ideas with people who use such technologies for their studies and work almost every day, but had never thought about how important such technologies can be in terms of directly impacting human lives by protecting people from cancer. So, being a nerdy physicist, I would say I enjoyed talking a bit of biophysics to fellow STEM students and their families! After all it’s the informal, multidisciplinary conversations about severe problems that give birth to phenomenal solutions. 4. Explain your current research/what you do at your job. How does your work impact society? I work on fabricating photovoltaics. More specifically, I study novel materials and device architectures to find a way to go beyond the theoretical efficiency limit (of ~33%, called the Shockley-Queisser limit) on single-junction solar cells. The aim of my PhD has been to equip myself with relevant knowledge in the field, and to gain the technical skills to be able to look at the problem from a broader perspective. As researchers, we are constantly working on finding cheaper and more efficient ways of converting sunlight into electricity so that we can convince businesses to actively transform the energy industry and save our planet from the global cancer we call climate change. 5. Have you ever had to embrace failure? Describe a challenging situation, either personal or professional, and how you overcame it. Oh, yes, of course! I was born and raised in a very tiny village called Yavatmal in India. When I was 14 and my younger sister merely nine years old, our parents decided to send us away to boarding school for better education. So at a very young age, I had to live alone and away from my family. My sister has always studied in different schools, and when we started university she moved to Boston while I moved to the UK. My father moved to Africa to expand his business, while my mum was taking care of business back in India. So, for almost 11 years now, I have been living independently and away from my family. I only get to see them once -- or if I'm really lucky -- twice a year. Both my sister and I have grown to be strong, independent women in our own lives, but we have had to accept that we were going to give up the luxury of being surrounded by loved ones while we grew up. And of course, when you live alone, you are dealing with plenty of challenges not only in your personal life but also when it comes to your work. I've had to keep a strong head and be responsible about all the choices I was making regarding my education and fields that I chose to work in. 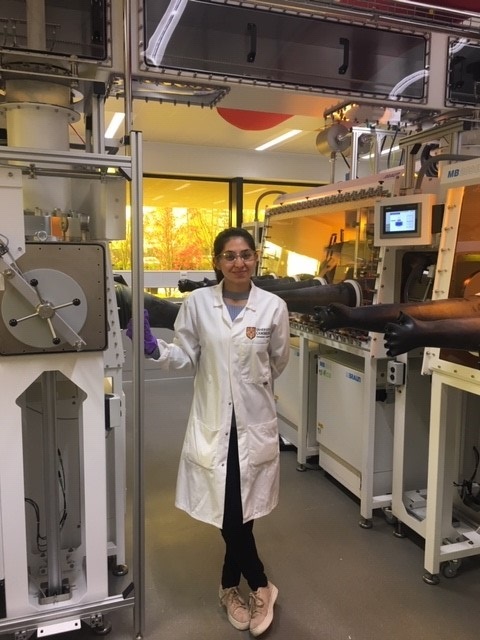 LAB LIFE: Arfa poses among her lab's array of glove boxes. "The organic/inorganic hybrid materials that I work with are very sensitive to oxygen and moisture. such as nitrogen or argon." The past 11 years of my life have truly shaped my character in every way and I am proud to say that I am a small-town girl from India who, thanks to her parents' forward-thinking and liberal mentality, is following her passion for physics at one of the best universities in the world! 6. When you look 5 years into the future, what do you hope to have accomplished? I hope to either have started my own company that is tackling a climate change problem in the energy industry, or be working for a company that is actively transforming the energy industry into a cleaner one. I am not sure what the best solutions to plastic waste, carbon emission, oil spills, and climate change are, but I am glad that we're recognizing these issues and acting on them. I hope that in five years time I am playing a more active role in protecting our planet. 7. What book has impacted your professional life the most? Your personal life? Why? Alaina G. Levine's Networking for Nerds! When she came to our Student Chapter, she talked about the book, how the job market works, and how we can find the most interesting roles by networking. It simply left me speechless. What's more is that it truly works! 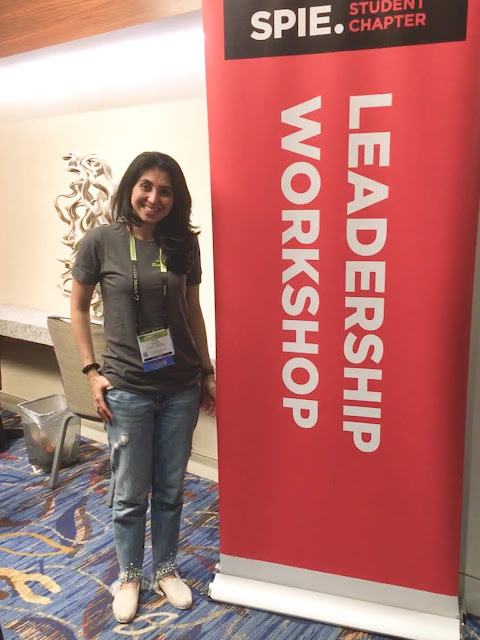 Throughout my journey with the SPIE Student Chapter, I have had the chance to meet with plenty of influential people in the field who have shaped my professional life at various stages. It is true, more so in the STEM field, that we forget the value of communication with people around us as we go deeper into our rabbit-holes. And I am guilty: at times I struggle to have normal conversation with people. But it's these types of conversations, as well as bouncing ideas off one another, that truly lead to innovation. I am grateful to Alaina for following her passion for science communication, and for leading the way for many mathematicians and other STEM students to follow. 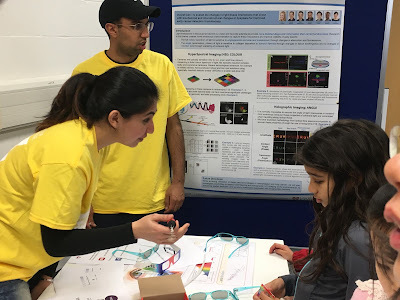 Cambridge Science Festival, where her student chapter had a booth. 8. 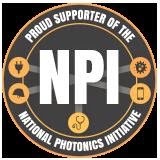 What are you most excited to see in the future development of photonics? Weatherproof, cheap, and extremely efficient solar cells! I can't wait for us to completely master the art of capturing all that energy from the sun that goes unharvested every single day! 9. What is your advice to others in the STEM community? I'm not sure if I am in a great position to give advice yet, but I can definitely share my opinion on the enormous value of collaboration across disciplines. It is incredibly important for us to realise that sharing ideas and looking at challenges from different angles is tremendously important in this globalization age. You do what you love the most, but don't forget to make that journey with collaborators and partners who understand other fields better than you: they can help you be one step ahead by contributing their skills and knowledge to tackling any challenge in life.